Storytelling + Research = LoiS: Rose Is Alive! I'm perfectly delighted to print a retraction . Never again will I look the same way at the Mark Twain quote about his death. 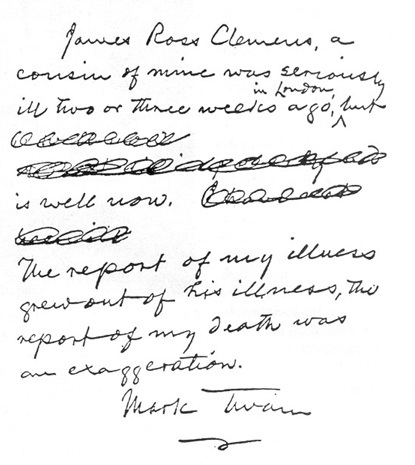 It has been variously given, but a reproduction of a May 1897 note says "the report of my death was an exaggeration." After printing the first of the series of photos by Mark Wilson, two storytellers were shocked to see me list Rose Owens as being "stilled in this world." I had a remembrance from my ever-rusty memory of seeing this on Storytell, but the list has undergone various transformations over the years and only recently has had a dependable archive that disappear whenever software or hardware changes occurred. Since it was moved to the NSN website I hope that an archive will remain. The questions stirred up by my posting this led me to look once again into Rose. I had not been able to find an obituary, her website hadn't been updated since early 2007, she was no longer a member of NSN, and I received no response to an email sent to her. Several long distance calls and emails seemed to do nothing to change what little I could verify. As I asked various people including the two whose questions prodded me, "How the heck do you prove somebody is or isn't alive these days if they aren't in social media (LinkedIn, Facebook, Professional Storyteller) nor answering emails and not otherwise written up?" Today I am so happy to say I received an email with the Subject heading: Rose is Alive! I am very much alive. It's one of those "domino" things. The Civprod email was abandoned when it got too much junk mail. Which meant that when then email sent to renew my website was sent, I didn't read it. So the Rosethestorylady.com website was purchased by another rose. Once I discovered this, I bought Rosethestorylady.net. I have not yet had time to locate the websites that link to my old email and let them know that I have a different website. My mother-in-law lives with us and she broke her hip and I have been very involved in her care. I continue to tell stories but have not actively been advertizing. So my storytelling activities have diminished but my love of storytelling has not. I have not updated my website recently but plan to do so later this summer. In the article you wrote, I hope you said nice things about me! Please spread the word that I am very much alive and share my current email address. I strongly recommend Rose the Story Lady's original website. We can all look forward to her return to activity on a new site and any additional storytelling activities she may offer. In a way I was correct in listing her as a Storyteller We Miss, but I'm glad she's going to return to whatever storytelling activity she can manage. She requests my posting her email, but I will do that on the Storytell list to avoid losing her again to an email account overflowing with junk mail. Just this past week I told the story about the father brought back to life by his son's unflagging questions that sent out a search party which found the father's bones, then the bones were made into a skeleton by one son, given skin by another, and brought back to life by the breath of yet another. The father was grateful for the help by his older sons, but credited the questions by the youngest son as bringing him back to life. This wasn't quite as miraculous, but it certainly has a wonderful ending.